There are many reasons to see art -- to get a taste of something beautiful, to engage in new ways with today's pressing questions, to escape to another era of the past, to see for a moment through another person's eyes. Yes, there are probably infinite reasons to spend some one-on-one time with an artwork or four this holiday season, but today we're focusing on one reason: healing. Art can reveal, shock and delight, that much we know -- but sometimes it has the ability to go deeper than the senses, to shift something inside us that is hard, if not impossible, to pinpoint or explain. For some, art has a certain spiritual or therapeutic power to change the viewer just by holding them in a certain time and place. Experiencing art can often be more otherworldly than a church, restorative than a yoga retreat, soothing than a day at the spa. We've compiled a list of 11 art destinations that, more than the average museum, intentionally cater to both the senses and the soul, in one way or another. Check one out if you're feeling particularly tapped out this holiday season, or whenever you want to treat yourself to a transcendent aesthetic experience. Behold, 11 art spots that will please your senses and soothe your insides. Let us know what we missed in the comments. What: Founded by Houston philanthropists John and Dominique de Menil, Chapel is a non-denominational sanctuary combining the powers of spirituality and art. It is part spiritual retreat, part modern art museum, part human rights center, featuring a series of dark purple and black works by Mark Rothko. Vibes: "We are reasserting man's natural desire for the exalted, for a concern with our relationship to absolute emotions," wrote Barnett Newman, whose sculpture "Broken Obelisk" sits outside the chapel. "[The paintings are] sort of a window to beyond," explained Suna Umari, whose worked at the Chapel for over 30 years. "[Rothko] said the bright colors sort of stop your vision at the canvas, where dark colors go beyond. And definitely you're looking at the beyond. You're looking at the infinite." What: Leonard Knight's adobe clay masterpiece, which is 50 feet high and 150 feet wide, revolves around the simple idea: "God Is Love." The outsider art mecca features paintings of trees, sculpted flowers, biblical quotes, bluebirds and a giant red heart, made from over 100,000 gallons of donated paint. Vibes: "The resulting lumpy, undulating structure, saturated with biblical verses and sayings, is a testament, as its name implies, to Knight’s religious salvation," said Sam Lubell of The New York Times. "But it seems more inspired by Candy Land and LSD. Swirling and striped reds, whites, yellows, greens, aquas and blues surround you." What: The piece of land art, made by sculptor Walter De Maria, features 400 stainless steel poles with pointed tips arranged in a rectangular grid amidst a vast New Mexican vista. The sculpture, which is meant to be both walked through and viewed, interacts with the surrounding landscape, creating an immersive experience best seen at sunrise and sunset. Vibes: "Seen from the porch, the rods marched away in phalanxes to the south. As the sun sank over our right shoulders, the metal spikes started to glow in the golden light. Their pointed tips took fire first, like candles, but soon the spikes themselves lighted up, top to bottom, as if glowing from within," wrote Cornelia Dean in The New York Times. "For me, it was as if a piece of formal music, a Bach invention, perhaps, had taken material form and was playing before my eyes, not my ears." What: This remote Utah canyon is known for its collection of Barrier Canyon Style rock art -- a distinctive style of pictographs and petroglyphs thought to be over 6,000 years old. The mecca of ghostly figures has been dubbed The Great Gallery, though the space feels more like a forbidden sandstone temple. Vibes: "They were strangely shaped with neither arms nor eyes and standing up to 4 feet high," said David Kelly in The LA Times. "One figure had feathers dangling from his arms. There were insect-like creatures and butterflies. Were they men, spirits, symbols? No one knows, so scientists refer to them as anthromorphs and describe the art as Barrier Canyon style, after the original name of this place." What: 500-acres of hills, fields and endless green expanses serve as home to 100 massive sculptures, yielding an adult art lover's version of a giant, zenned-out playground. Vibes: "The view made me think that Ralph Waldo Emerson, an inspiration to the Hudson River School painters (whose work Storm King’s founders originally intended to house here in the 1960s), must have been nearby when he wrote: 'The health of the eye seems to demand a horizon. We are never tired, so long as we can see far enough,'" wrote John Motyka. What: This site-specific installation is James Turrell's 73rd "skyspace," which performs with 40-minute light shows that lead up to sunrise and follow sunset, with slight variations depending on the weather and season. LEDs sync up with the changing colors of the sky, yielding a magical experience that feels like looking out unto infinity. Vibes: "If you take a photo of the sky in this skyspace, the color you see in the opening is not actually going to show up in your camera because in fact it is not there," Turrell told Here Houston. "We do create the world in which we live to a much larger extent than we are willing to take responsibility for." What: The collaborative Sound and Light Environment, made by composer La Monte Young and visual artist Marian Zazeela, lives on the third floor of a TriBeCa building, housing within it "a time installation measured by a setting of continuous frequencies in sound and light." The very long term, ongoing exhibition opened in 1993 and runs until 2015. Vibes: "Visiting The Dream House can be a baffling, delirious experience," wrote The Observer's Andrew Russeth. "The room is soaked in purple light. Huge speaker stacks emit a constant, potent drone, which music critic John Rockwell called a 'cosmic throb.' It is often very hot, but it is not uncomfortable. There are pillows, and you can recline, letting the sound work on you. It’s really something." What: In 1957, believing that he was following orders of visitors from planet Venus, George Van Tassel built a structure supposedly capable of rejuvenation, anti-gravity and time travel due to the intermittent magnetic fields inside the space. The large white dome now serves as a site for quartz sound baths, where visitors can recline in the acoustically perfect sound chamber and feel the vibrations of musical quartz bowls. Vibes: "It's 105 degrees outside, and sunlight is streaming in through 15 windows ringing the rotunda," wrote The LA Times' Scott Gold. "Somehow, it is not hot, not in here. The notes clash over your head, some in breathtaking harmony, some in startling dissonance. Just when you're starting to see patterns in the grain of the wood in the soaring ceiling, it's over. There is silence, and no one moves. The acoustics are so good you can hear a man swallow from across the room. It has been either the shortest or the longest half-hour of your life." 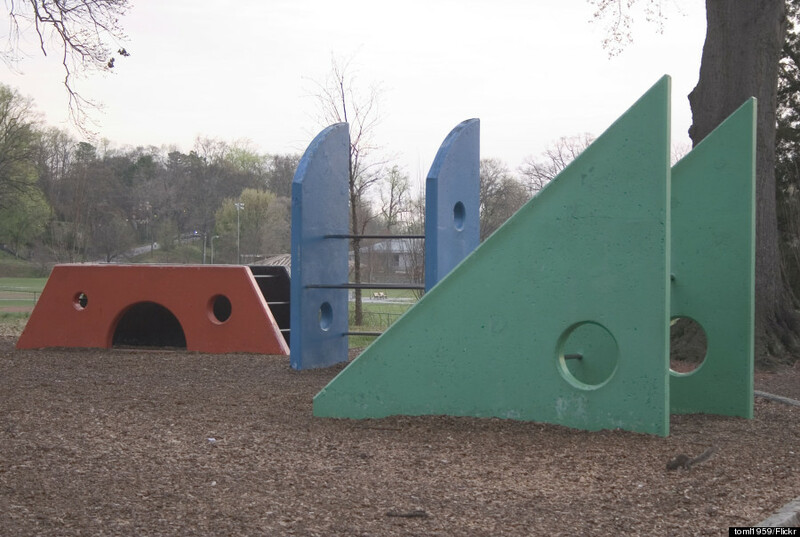 What:Noguchi constructed this severe, minimalist playground in 1976 in Atlanta's Piedmont Park, discarding prescribed methods of "playing" for something more imaginative and exploratory. The avant-garde sculptor toys with the space between art and experience, equipment and sculpture, object and landscape, seriousness and play, letting each viewer -- kid or adult -- encounter the unusual art experience in his or her own spontaneous way. Vibes: "Kids are challenged to decide how to creatively play with these oversized objects," said Robert Witherspoon of the City of Atlanta’s Public Art Program. "It’s not scripted what to do on the climbing cubes, play mound, and jungle gyms -- you have to improvise." What:Artists Chad Sorg and Mark Rippie have turned the desert into a museum, installing over 40 automobiles tipped on their heads and stacked on top of each other, like a set of rotting Hot Wheels for the gods. What:In 1986, artist Donald Judd opened a contemporary art museum with permanent and public exhibitions which are linked to (and inseparable from) the surrounding landscape, turning the entire city of Marfa into a dreamy space somewhere between an artistic fabrication and real life. It includes John Chamberlain's mangled automobiles and Judd's maze of 100 milled-aluminum boxes, each the same size yet with slightly different interiors. Vibes: "It takes a great deal of time and thought to install work carefully," Judd wrote in his first catalogue. "This should not always be thrown away. Most art is fragile and some should be placed and never moved again. Somewhere a portion of contemporary art has to exist as an example of what the art and its context were meant to be. Somewhere, just as the platinum iridium meter guarantees the tape measure, a strict measure must exist for the art of this time and place."